We also offer hard-to-find mattress accessories, such as mattress protectors, stain guards, and luxury bedding. If you have a bedding need, we can fill it here at Best Mattress. To make your mattress shopping experience as smooth as possible, we also offer same day delivery, free set-up and removal, and a 120-day satisfaction guarantee. If you aren’t happy with your mattress, you can return it anytime during this time frame and we will offer you a full refund or in-store credit towards another mattress of your choice. We strive to keep our website up to date with all of the latest brand information, specials, and financing options. However, if you can’t find the information that you are looking for on our website, feel free to call our store anytime. Our Spring Valley store is located at 6870 South Rainbow Blvd, Las Vegas, NV 89118. We are located in a retail center that is easily accessible from the freeway, so that you can stop in and see us anytime. The easiest way to get to our Spring Valley store is via Rainbow and 215. Our store is directly between Rocco’s NY Pizza and Pasta and the Urgent Care Clinic. We are eager to talk with you and help you find the best mattress you’ve ever had. Brian certainly is enthusiastic about finding the right match for you! Consult this sleep expert for knowledge on Serta, Simmons, Tempur-Pedic, & Five-Star brands. He knows all the details about Simmons products. Whether you are looking for a BeautyRest Black, Silver or Platinum, he is the guy. Serta’s Perfect Sleeper & iComfort definitely fall within his expertise. He can pair any brand with the adjustable base of your dreams at a low price with all the protective accessories that make your sleep the best! Nothing makes our manager, Dan Saielli, happier than hearing about a positive customer experience. Dan loves to talk with customers about their shopping experience and their satisfaction with our products, so that we can better serve the public. If you have any comments about your mattress or your shopping experience in general, either positive or negative, please don’t hesitate to reach out to us. 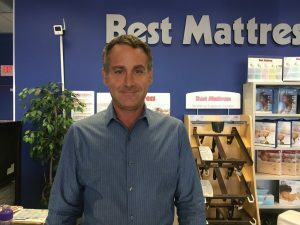 Best Mattress has a longstanding history of a dedication to customer service. We have been locally owned and operated since 1994, which means that our top managers are always available to resolve your concerns. If you aren’t pleased with your mattress or your experience in any way, we want to hear about it. We thoroughly enjoy talking with customers about their shopping experiences. Best Mattress welcomes your feedback and reviews on websites like Yelp, Twitter, and Facebook.